შაბათს, 29 ნოემბერს 2-დან 5 საათამდე. დეზერტირების ბაზრის აუდიო ტური შექმნილია მარიკე სპლინტის მიერ გეოეართან თანამშრომლობით პროექტ “კულინარიული წარმოდგენები: თბილისელი მიგრანტების ისტორიების” ფარგლებში, ლექსო ჯანიაშვილის და CES განსაკუთრებული მხარდაჭერით. პროექტი ხორციელდება პრინც კლაუსის ფონდის ფინანსური მხარდაჭერით. Saturday, November 29th between 14:00-17:00. Meeting point at Caffca Café. 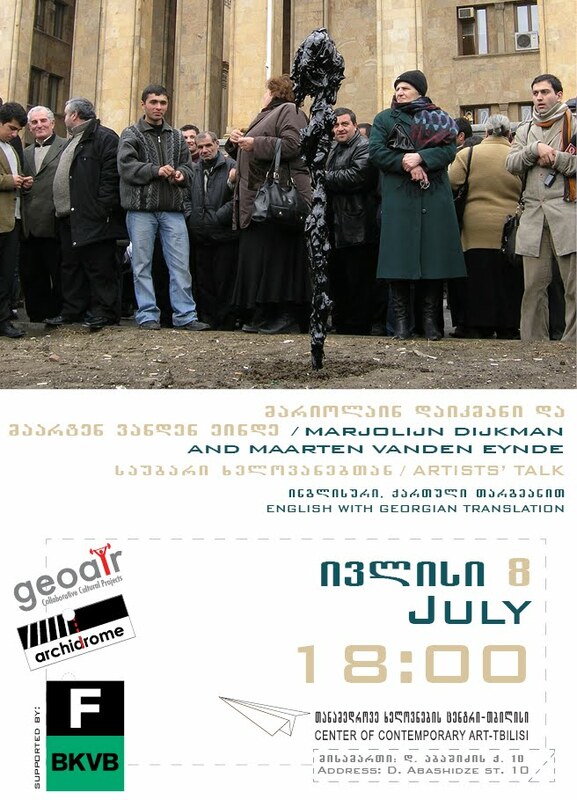 Dezerters Bazaar Soundwalk is realized by Marike Splint in collaboration with GeoAIR + Archidrome in the framework of “Cooking Imaginations: Tbilisi Migrant Stories” project with generous support of Lexo Janiashvili and CES. Project is implemented with the financial support of the Prince Claus Fund. მარიკე სპლინტი არის ამსტერდამში მოღვაწე თეატრის რეჟისორი და მასწავლებელი, რომლის საქმიანობაც ხორციელდება ადგილობრივი და საერთაშორისო კუთხით. მისი პროფესიული გამოცდილება უკავშირდება როგორც კლასიკური სპექტაკლების გადააზრებას, ასევე, თანამშრომლობის საფუძველზე ახალი სცენარებისა და პერფორმანსების შექმნას. მარიკეს ყველაზე მეტად აინტერესებს ადგილსპეციფიური თეატრის თემა და საერთაშორისო თანამშრომლობა. 2011 წლიდან მოყოლებული, ის არის ევროპის წამყვანი ადგილსპეციფიური თეატრის ფესტივალის, Oerol-ის ერთ-ერთი რეზიდენტ-რეჟისორი. ასევე, ის არის Roma B.-ს სამხატვრო ხელმძღვანელი და ადგილობრივ თემთან ერთად მომუშავე თეატრალური სივრცის, Theaterstraat-ის დამფუძნებელი და წევრი. 2011-წლიდან, მარიკე წარმოადგენს ასოცირებულ ხელმძღვანელს TG Space-ში, სადაც პოსტ-ინდუსტრიულ სივრცეებთან დაკავშირებული კოლექტიური მეხსიერების შთაგონებით იქმნება ინტერაქტიული აპლიკაციები. გეოეარის რეზიდენციაში მისი ყოფნის დროს, მარიკე იმუშავებს პროექტ „კულინარიული წარმოდგენები: თბილისელი მიგრანტების ისტორიების“ ფარგლებში და თბილისის ერთ-ერთ ბაზარში შექმნის ინტერაქტიულ ხმოვან ტურს. ბაზარი საჯარო სივრცეა, სადაც ყველანი მივდივართ იმ ინგრედიენტების საშოვნელად, რაც ჩვენი კულტურისთვის დამახასიათებელ კერძებს სჭირდება. ბაზარი ყოველდღე არსებობს, მოვაჭრეები ერთსა და იმავე ადგილზე არიან. ყიდვა, ვაჭრობა, აწონა, გასინჯვა, ყნოსვა და შეგრძნება იქ ყოველდღიურად ხორციელდება. ამ ყველაფრის პარალელურად, მარიკე შექმნის გარემოს, სადაც სტუმარი იმოგზაურებს იმ პირად მოგონებებში, რაც კონკრეტულ კერძებსა და მათი ინგრედიენტების შეძენას უკავშირდება. ხმოვანი ტური ბაზრის ყოველდღიური ქმედებების უკან არსებულ ისტორიებს გაამხელს. internationally. Her experience ranges from re-imagining classic plays to collaborating on original scripts and creating devised performances. She has a strong interest in immersive site-specific theatre and international collaboration. Since 2011, she has been one of the resident directors of Oerol, Europe’s leading site-specific theatre festival. She is the artistic director of Roma B. and founding member of the Theaterstraat, a shared theatre space working together with the local community. Since 2011, she has also been associate director at TG Space, creating interactive apps in former industrial spaces inspired by the collective memory of that place. During her residency stay at GeoAIR, Marike will work within the project “Cooking Imaginations: Tbilisi Migrant Stories” and create an interactive sound walk through one of the markets in Tbilisi. The market is the public space where everyone comes together to find the ingredients for the recipes belonging to their culture. The market happens every day; the merchants are there every day at the same place; the same actions of buying, bargaining, weighing, tasting, smelling, feeling occur every day. In the midst of all this she will create an experience that transports the audience to all kinds of intimate memories related to the dishes that people are buying their ingredients for. The soundwalk will unveil the stories behind the everyday actions at the market. მარიკე სპლინტის რეზიდენცია არის პროექტ “კულინარიული წარმოდგენები: თბილისელი მიგრანტების ისტორიების” ნაწილი, რომელიც ხორციელდება პრინც კლაუსის ფონდის ფინანსური მხარდაჭერით. Marike Splint’s residency is the part of the “Cooking Imaginations: Tbilisi Migrant Stories” project, implemented with the financial support of the Prince Claus Fund.